50 and 100 hour Weekly Yoga Retreat in Rishikesh, India. Ever thought of combining a vacation along with yoga? If not then here is the chance of not only to chill in a zen location across Ganga for a few days, but also to have the feel of ancient science of yoga in the most spiritual place of India and the yoga capital of world: Rishikesh. Be open to learning, self-discovery and open to becoming who your soul is longing to be. We have designed our affordable one and two week yoga retreat courses in Rishikesh with exactly this in mind wherein, learning is accelerated, confidence is amplified and new habits are formed. This is where deep transformation happens. Shiva Yoga Peeth has an amazing combination of quietude and magnificence. A place resonated with vividness that mere words can’t describe.Swami Sudhir Anands personal attention making this 50/100 hr course total unique and different. Schedule may be change according to the situation,Sunday will be no class but we can use for educational tour and may be only one extra class . 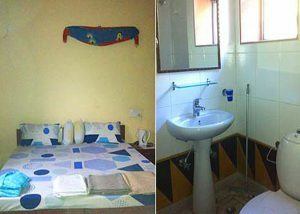 During our yoga teacher training courses we provide our students with clean rooms, bedding (two single beds) and attached western style toilets with hot & cold water. Each room has a fan. Each student gets a private room. Students will be staying in Sant Seva ashram facing river Ganga and Mountain view. What an authentic traditional Indian experience that would be staying in ashram and that too by the holy river Ganga. Sant Seva ashram is facilitated with spacious 82 rooms and is located just adjacent to our yoga school. Each student has the privilege to feel the energy of mother Ganga and attain her bliss.